SCP-1576 as documented in 19██. Special Containment Procedures: SCP-1576 is to be contained in a containment locker located below Area-89. No personnel are to be admitted access to this chamber. Original documentation relating to SCP-1576 is to be stored in Area-89's archives. Copies of these documents have been stored in Site-77's archives. Instances of SCP-1576-1 are to be held in humanoid containment chambers with all ventilation and plumbing systems disconnected. Entryways to these chambers are to be sealed from the outside, with an airlock between the entrances and the outside. Instances will survive between 1-4 months before death. After expiration, they are to be incinerated. Once the instance has been removed, the chamber interior is to be disinfected. When no trace of affected material remains the chamber is to be used for containing additional instances of SCP-1576-1. Agents in Edison, NJ, and Ft. Myers, FL, USA are to monitor medical reports for signs of SCP-1576-1 cases. In the event that an instance is located, the cover story of CDC intervention for a new form of meningitis. Description: SCP-1576 is a black wooden box, with mechanical portions attached to its interior and exterior. The interior portions are composed primarily of brass gears and cylindrical glass tubes. SCP-1576 can cause subjects to hear the voices of deceased relatives or friends. These voices will attempt to keep the subject listening to them as long as possible. The knowledge these voices have about the subject will be based on the subject’s memory. Information the subject was not aware of will not be provided, and there will be inconsistencies and contradiction in the voice's testimony. SCP-1576-1 designates human subjects with an anomalous condition caused by using SCP-1576. SCP-1576-1 instances will frequently sneeze and display reduced mental capacity. Sinus cavities will fill with mucus, and the instances will report severe migraines. Instances of SCP-1576-1 will report headaches, unusual dreams, and experiencing memories of other SCP-1576-1 instances. Testimony of D-1544 after becoming an instance of SCP-1576-1. The first thing I saw was the stars. I remembered seeing them overhead, lying on an old convertible in a field. I was a girl there, young. We were both young. He moved closer to me as the stars danced above. I didn't see anything after that, it was like people in my head were changing a projector to a new slide. There was one that looked like it was from the forties. This time, I was a completely different guy. He was old, and decrepit. I could feel his bones pulling against the muscle as he walked, holding him back. He had a hickory cane that he gripped, so hard it left an imprint on his palm. There was a diner, and I went in it. The lady smiled at me, and took me to a two-seat booth. I ate alone. Instances of SCP-1576-1 will experience the slow dissolution of their cranial tissue. Dissolved cranial tissue belonging to SCP-1576-1 will eventually settle within the nasal passages, and be expelled alongside mucus. If subjects inhale the particulates expelled by the SCP-1576-1 they will become an additional instance of SCP-1576-1. SCP-1576 was discovered in 1940, from Menlo Park, NJ, USA. Agents had been investigating an outbreak of mental disorders in the area, which led them to discover SCP-1576 being used as a recruitment tool for the Hoboken Paranaturalist Society occultist group. 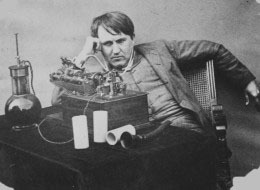 Members of the group claimed that inventor Thomas Alva Edison had built SCP-1576 for them, and that it was designed to allow communication with the dead. The colds are only a side effect. Clarence says he'll be returning to work soon. We've had to revise the theory. Little people don't have to be in the mind to leave. Sometimes they can go early and take things, like memory, and the brain's ability to function. They stay organized, and go by themselves. This is our fault. We showed them what they really are. Mr. Edison appears to have associated himself with the organization for a period of only two months following which he left, denying any involvement. During this two-month period several prototypes were created. SCP-1576 appears to be the only one created with any functionality, though recovered evidence indicates agents for Prometheus Labs acquiring and reverse engineering nonfunctional prototypes to form SCP-2167 and similar anomalies. As of 1/12/1950, SCP-1576 has been contained and classified as Euclid. Addendum 1576-A: Reports from Ft. Myers, FL, indicate that members of the society have existed there since 18██. Agents posted in the area are to monitor local medical centers for signs of SCP-1576-1. Containment procedures have been updated. Addendum 1576-B: Document recovered from the office of Dr. Musgrove who had been the lead researcher for SCP-1576 at the time of his death. Further study into the nature of this note is ongoing. I'm really tired. This cold has been kicking me down, and I just can't even get up anymore can't get up anymore, it's almost all I can take to just sit in the office. Nothing else to to to do really, the tests are going slow. I don't remember why we we we we started this, but it's going to get bigger soon. We're hoping to get greater results.